Add an extra shine to your complexion with CosmoHerbal’s newly formulated foundation cream that comes enriched with anti-oxidants, vitamins and an anti-UV therapy. Whatever be the occasion! Business meeting, a conference or an unplanned party, here’s a one-stop solution for you. 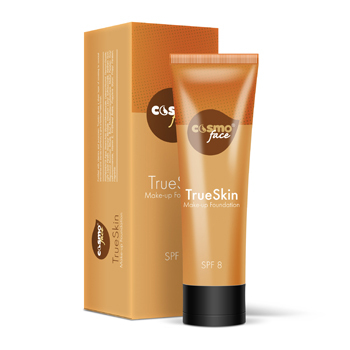 Get glossy with Cosmo herbal’s exciting range of True Skin Make-up foundation, fit for all kinds of occasions. This multi-benefit foundation comes enriched with anti-oxidants, vitamins and sunscreen ingredients which along with the luminous glow on the face provide an inner shine and a long-lasting effect on the skin.